The UK-made VWFG is a unique, portable, heavy-duty weighing solution. 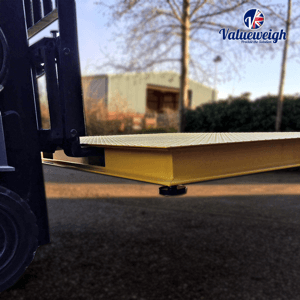 Built-in forklift guides allow the platform to be quickly and easily picked up and moved to another location, providing flexibility to weigh wherever it is needed. Renowned for it’s impressive design and build quality, it is one of the strongest and most durable platform scales available. All models have OIML approved, IP67 loadcells with a capacity of up to 5,000kg as standard (higher capacities available on request) guaranteeing accurate and reliable weighing in the harshest of environments. Every model can be customised to meet specific requirements such as custom fork width/spacings, dimensions, capacity, colour and mounting frames. All models feature a stainless junction box and a highly durable powder-coated finish.